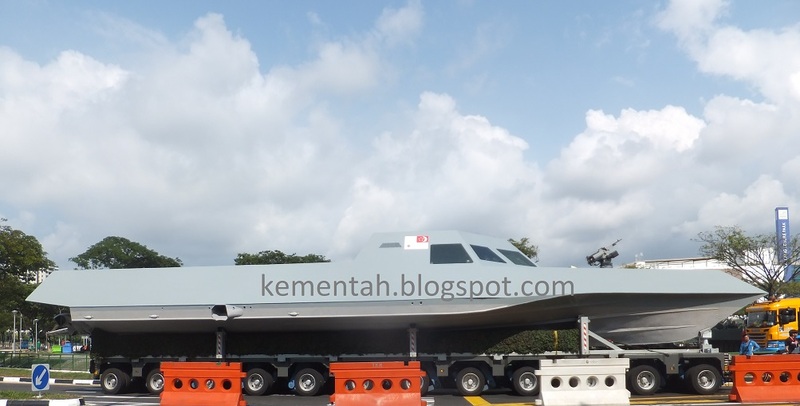 Faster than anything bigger, stealthier than anything faster, the Republic of Singapore Navy’s (RSN) Specialised Marine Craft (SMC) semi-submersibles are in a class of their own in the Singapore Armed Forces arsenal. Designed and built in Singapore, SMCs have been protecting Singapore’s maritime interests since 2009. 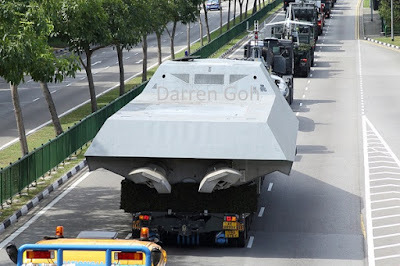 But these compact craft were largely unknown till the first Combined Rehearsal (CR1) for the National Day Parade when the 22-metre craft made a surprise appearance mounted on a KAMAG K25 trailer as part of the RSN's contribution to the Mobile Column. There’s a bigger surprise in store for defence buffs. The SMC seen during CR1 and CR2 may be a sanitised version of the SMCs used by the RSN. This much was clear in a video featuring the SMC that was posted by the RSN on its Facebook page over the weekend. The teaser, just 43 seconds long, showcased what appeared to be an SMC of a different design from the one seen at the two Combined Rehearsals. The RSN currently has three SMCs on active duty and plans to add five more over the next two years. Sleek and futuristic-looking even out of the water, the SMC comes into its own out at sea. The high-speed craft's published speed "in excess of 30 knots" is a modest understatement of how fast her twin Hamilton waterjets can propel the 22-metre long SMC in open water. "The SMCs are deployed for base defence and force protection. They will also operate alongside the (Fearless-class) Patrol Vessels/(Independence-class) Littoral Mission Vessels to deliver swift, flexible and decisive responses against maritime security threats," said a Ministry of Defence Fact Sheet on the NDP 2015 Mobile Column. Taken at face value, the SMCs might come across as just another surface platform in HQ Fleet. 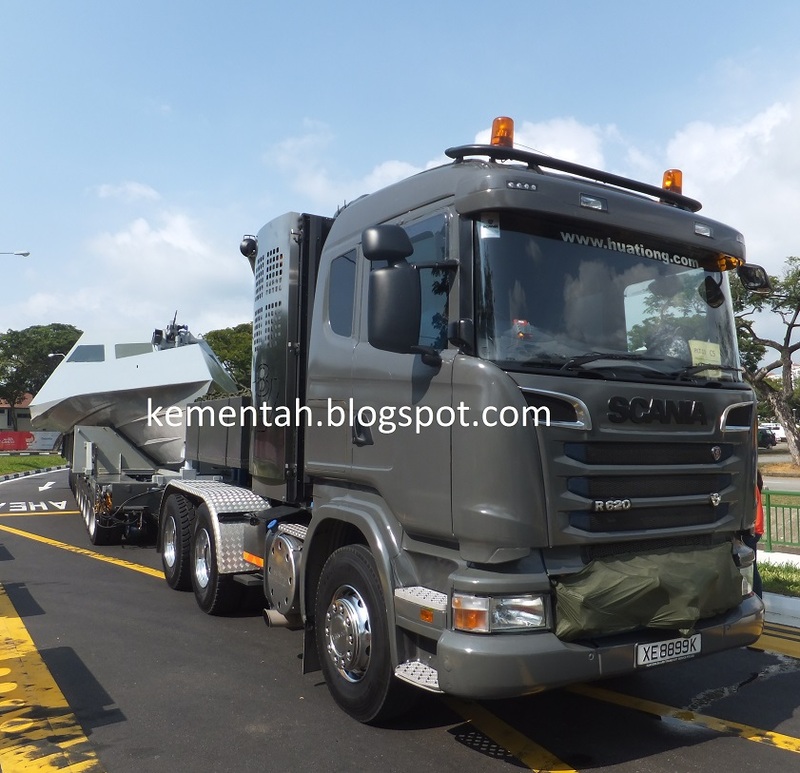 But it is unlike any other in the Singapore Armed Forces (SAF) and has few peers in any navy. Indeed, the Defence Technology Prize Team (Engineering) Award secured by the SMCs designers back in 2006 and the tight lid MINDEF/SAF imposed on any image or mention of the SMC's warfighting potential, provide telling hints on how special this craft really is. If off-the-shelf solutions were an easy answer, the joint team from the Defence Science & Technology Agency (DSTA), DSO National Laboratories and Singapore Technologies Marine need not have bothered with conceptualising the SMC in partnership with RSN naval warfare planners. The SMC design points to extensive efforts at creating a high-speed marine interceptor that can hunt and kill its quarry undetected. The SMC's low observable design makes it ideally suited to complement Halmatic VSVs (at 60+ knots, the VSVs are the SAF's fastest vessels) fielded by SAF Commandos for unannounced visits behind enemy lines, possibly in the dark of night. As more than 10 years have elapsed since the kick start meeting that resulted in the SMC, it's a pretty safe bet that the SMC design and CONOPS has matured substantially in the past decade or so. 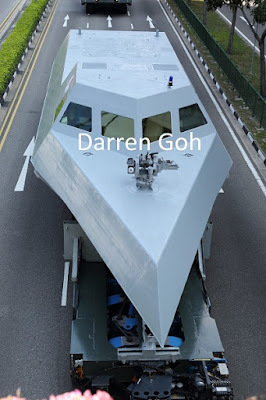 The SMC design defence observers scrutinised at close quarters during the NDP rehearsals stems from a project started about a decade ago for a naval craft whose in-service date harks back to 2009. Indeed, follow-on projects to the vanilla "SMC" presented to the public may already be on the water, awaiting the lifting of the veil of secrecy imposed on these new fast semi-submersible craft. Don't count on seeing the new designs anytime soon though. Perhaps at SG100? Compare and contrast: The SMC on the trailer is the one the Republic of Singapore Navy will showcase as part of the NDP 2015 Mobile Column. The one on the water is believed to be an operational example. Diifferences are apparent in the comparison of bow (above) and stern (below) perspectives. Speed: "In excess of 30 knots"
The 'display boat' is more than likely the first prototype, with the operational SMC incorporating improvements. There's also the possibility of the SAF acquiring different variants, but range would be the limiting constraint for such a small design. I actually find it interesting that the RSN hasn't operated something similar like the CB90 class for inshore and riverine purposes. BTW, doesn't this look similar? This craft goes at least 10 years back. I recall seeing it during a visit to Loyang Tua Pek Kong at its previous address by the coast at 62G Loyang Way. The idle old men at the temple recognise the craft as well. "Oregon Iron Works, a small specialist manufacturer has designed and produced a series of special forces infiltration boats currently employed by Israeli special forces, Singaporean Navy and USN SEALs/SOCCOM. The original patents were filed in 1990."